The rear standard and bellows were rotated 90 degrees together while the front standard remained fixed to the base. 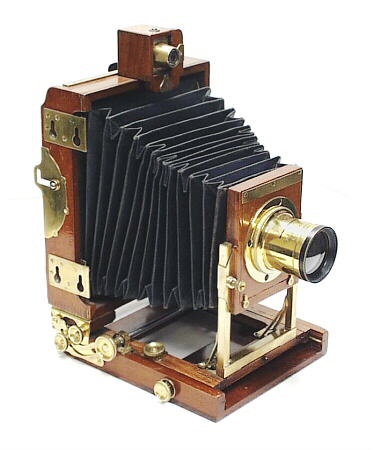 Although the back was still connected to the camera via the bellows, it was inevitable that the bellows wore quickly because of stress placed on the pleats. This example is Serial No.74, a 6-1/2" x 8-1/2" model. Anthony's 1891 Catalogue For Amateurs lists this camera for $38 ($720 in year 2000 dollars) and able to accept a 20" lens. Also shown with the camera is Anthony's Universal View Finder, which could be attached to any camera in landscape and portrait orientations. 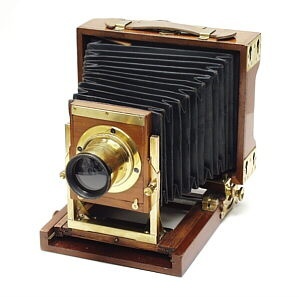 Anthony cameras are highly prized by collectors because of the company's historical legacy and innovative designs. A compact folding design, polished mahogany and liberal use of brass hardware gives the Phantom a look that is unique even among Anthony cameras. The invention consists in so attaching a bellows to the front part of the camera as to allow the bellows to turn or revolve, where by only the rear part of the camera needs to be loosened to change the position from vertical to horizontal or vice versa without altering the position of the front part of the camera, to which the lens is attached. E. & H.T. Anthony & Company, NY. Anthony Phantom camera with the back positioned in the landscape orientation.